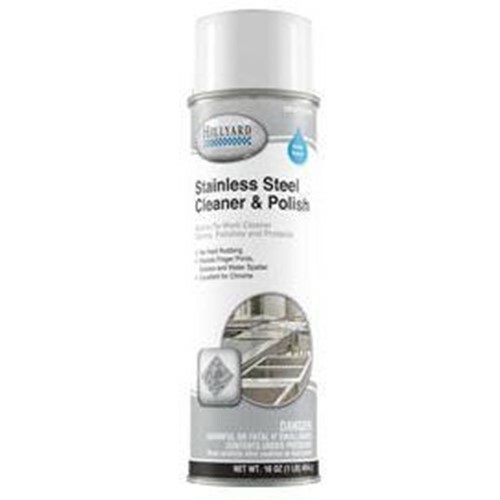 Hillyard Water Based Stainless Steel Cleaner and Polish provides the performance and gloss typical of oil based stainless steel cleaners but in a fast breaking economical foaming water base. The silicone free formula utilizes a food grade protectant which is easy to work with and dries to a non oily film for use in public areas on escalators, elevators, and other areas. No excessive residue, no hazing and no excessive buffing are required. The high gloss restores luster and protects stainless steel, chrome, aluminum, brass, copper, and most other metal surfaces. Applications can be found in food service, offices, hotels, schools, airports, municipal and government buildings, and much more. Resists finger prints grease and water spatter.